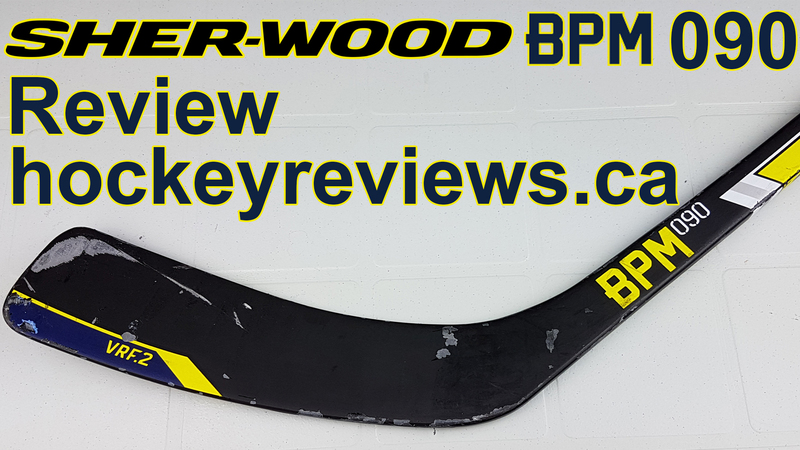 Thank you to Sher-wood for sending me this BPM090 stick for review. This review was slightly different than most, the point of this was to compare a price point stick (in this case the BPM090) in my prefered specs compared to a clearance top end stick where you have to take whatever curve and flex pattern is still left on the wall. 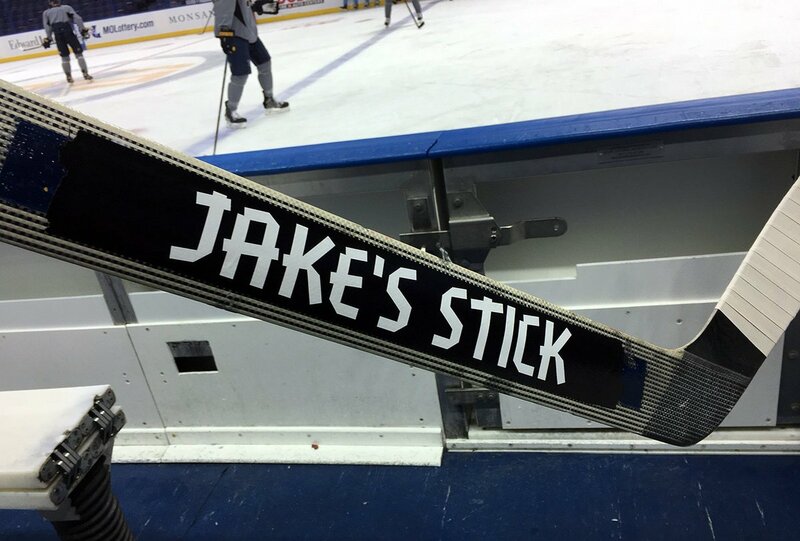 This stick was also to be used by my teammates to get feedback from them and compare it to their plethora of clearance and price point sticks. I also must apologize for this review not coming out sooner, I gave it to my teammates to pass around and needless to say I didn’t get it back for a few months. The grip ends right next to the silver stripe on the top and bottom portion of the stick. Aesthetics: I enjoy colourful designs and accents, but I feel Sher-wood made a mistake with the BPM series of sticks, especially considering how understated and classy the T120 looked. But perhaps I am biased as the black with red and gold accents with exposed carbon fibre reminded me of the last generation of Lotus F1 cars. There are certain aspects of the design on the BPM family of sticks that I actually really like, the contrasting colours look great with each other and the BPM detailing found on the bottom of the stick looks good as well. Sher-wood no longer pays the NHL feels to have their logos visible on gloves or sticks, the result was Sher-wood cleverly adding details to the paddle and shaft of their goalie sticks with team specific colours. While not immediately obvious of the branding, keen eyed viewers instantly know what type of stick is being used even without the company’s brand visible. Going back to another Formula 1 reference, this type of design happens in other sports were certain brand can no longer advertise. In this case the cigarette company Marlboro who used to be a primary sponsor for Ferrari racing teams. Thanks to reddit user TheTrueSurge, Marlboro never really left Ferrari racing and still sponsors the team today just without their “logo”. I feel like Sher-wood does an excellent job with this branding, and while the design isn’t as funny as the famous “Allen Wood” stick I would prefer if Sher-wood went to a similar branding route with their retail hockey stick offerings. The BPM150 has exposed carbon fibre on the blade up to the bottom of the shaft as well as at the very top of the shaft. But the rest of the shaft is painted in the BPM yellow and navy blue which is a far cry from the exposed carbon design on the previous T120 sticks. I believe this is a case of too much colour and paint, the BPM150 stick is also heavier than the outgoing model (paint isn’t weightless). Sher-wood’s use of contrasting colours along with exposed carbon fibre work well with the Rekker EK60 line and I wish the BPM followed that pattern with the BPM series. 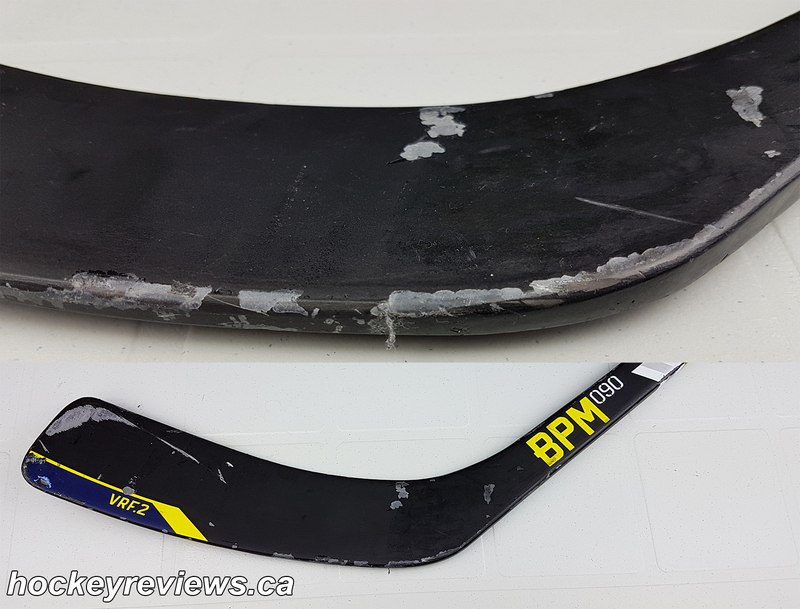 This BPM090 stick is slightly more disappointing than the BPM150 as the entire BPM090 stick is painted. 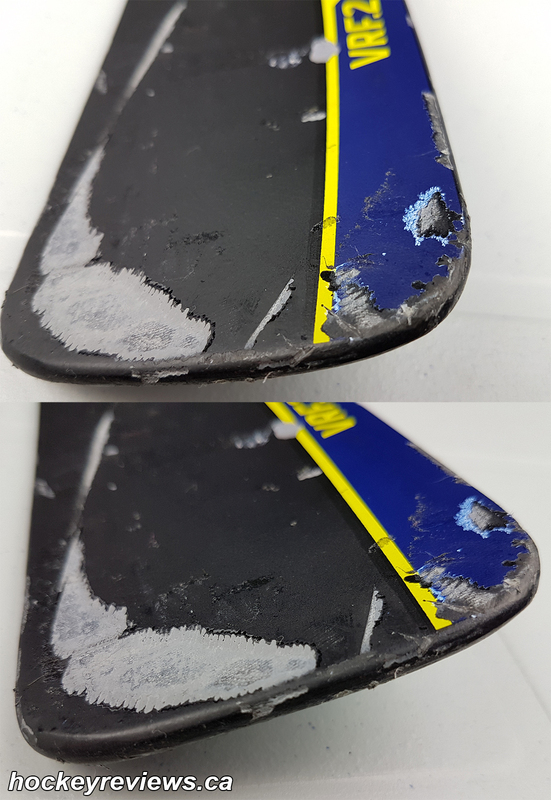 While I understand the need to differentiate between the top end stick and their price point sticks (I mentioned this in my Warrior QRL review), the Rekker EK40 still had an exposed carbon blade and the older T90 sticks have plenty of exposed carbon fibre throughout the blade and shaft. The PP05 Heel curve is one of my favourite designs. I am a fan of the fairly stiff VRF.2 blade, but it feels thicker than other blades and isn’t as stiff as I’d prefer. The stick is advertised as having concave walls, but the outer walls feel completely flat. 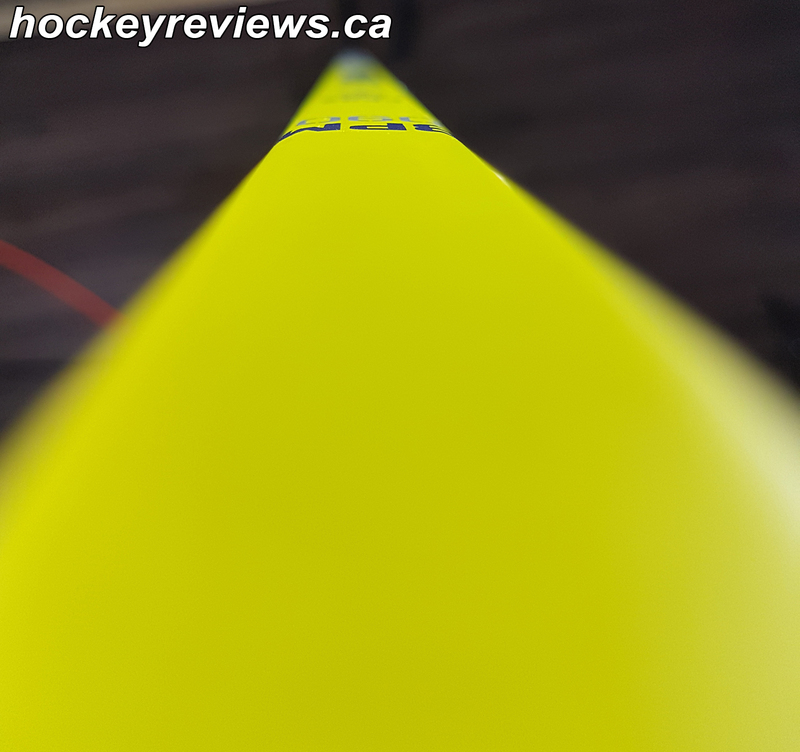 Shooting: Sher-wood’s price point sticks (and all of their sticks in general) have had a reputation of punching above their weight and being the best bang for your buck hockey sticks on the market. Since I don’t normally use price point sticks I will have a hard time quantifying that. 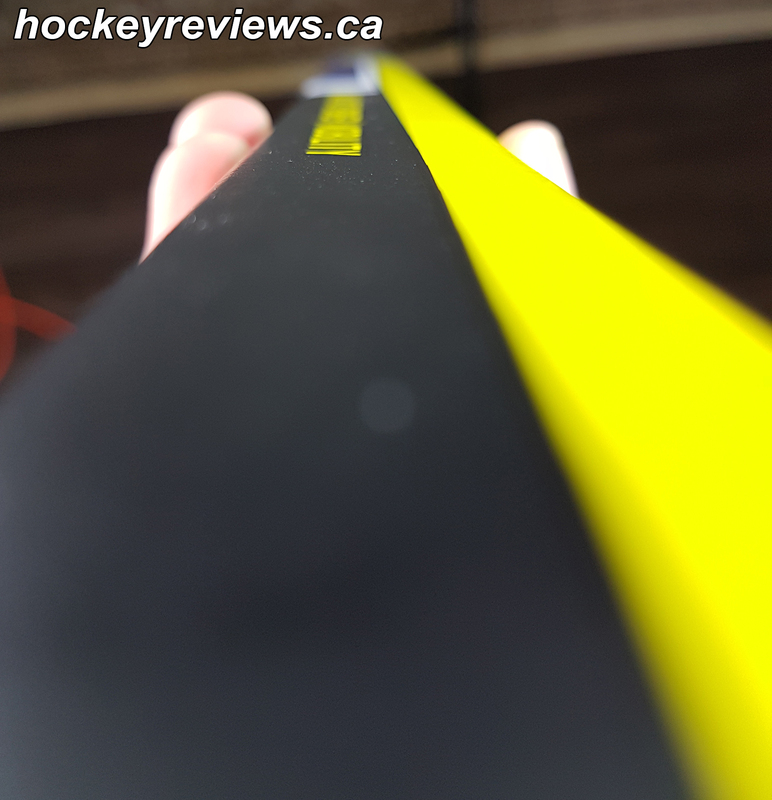 I wanted to be able to talk about how this stick compares to other price point sticks so I shared the Sher-wood BPM090 to teammates to get their opinions on how the stick played and how it shot. With that said this rating will reflect my personal experiences with the stick, and it will be compared against top end sticks at significantly higher price points. Unfortunately for the BPM090 it is coming against the two best shooting sticks I have ever used (Warrior Covert QRL and CCM Ribcor Trigger). I mentioned earlier that I believe the flex on the Sher-wood sticks are true to their rating, but I feel like flex is hard to measure when stick shoot so differently. I feel this is very evident when comparing this stick and the other two sticks mentioned, while putting effort in bending the stick is similar the shot speed/ease of release are so vastly different you could believe you are using a stick that is too stiff. When you load the BPM090, the result isn’t close to the same kick as top end sticks, and while I wasn’t whiffing shots I never felt I got off the shot I should’ve. While the QRL and Ribcor Trigger and low kick sticks, my experience with high end mid kick sticks confirm my feelings about the release of the BPM090. The price point stick simply doesn’t release as quickly or easily as the top end competitors. When manage to get off a perfect shot with a top end stick the puck feels like it launches off the blade, with my best shots with the BPM090 they feel like an average shot with the $300 sticks. My teammates had slightly different opinions than I did on the shooting ability of the BPM090, they also aren’t directly comparing a price point stick to an elite top end (eg. Easton ST, Sher-wood T90). All of them came back to me saying it felt well balanced but a bit heavy, while their shots felt good but they had to adjust for different length than what they are used to. Facing them as a goalie in warmups they had the same heavy and quality shots they always had, these shooters were talented but not necessarily top end snipers. Passing: Just like the curve section I usually start this section talking about my preference for heel curves and how I have to adapt or manage with non-heel curve sticks. I was very happy to be back using a heel curve as I am a pass first player. The BPM090’s PP05 allows you to slide the puck off the heel and off the ice allowing you to saucer pass with minimal effort. 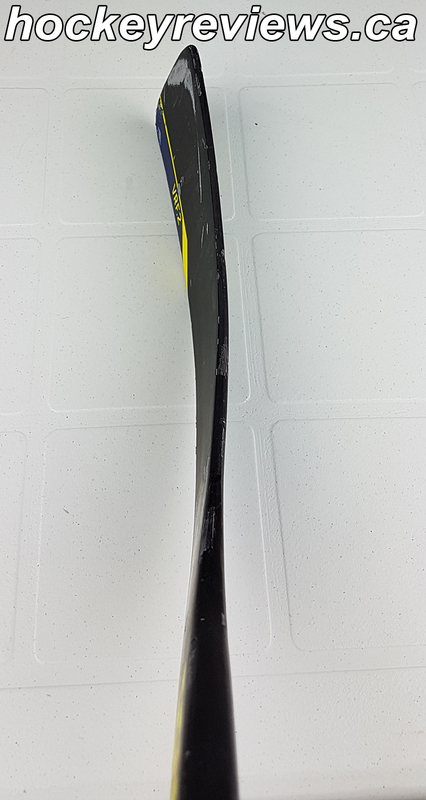 With heel curves I feel like I can just push the blade forward and the stick does the work for me with the end result being a flat airborne pass. The flatness of the blade and heel curve also allow for easy back hand passes and saucer passes, a play I am hesitant to make with the W03 or P29 curve. For me the heel curve allows me to get off a pass in any stick position without ever having to worry where the puck is located on the blade of the stick. 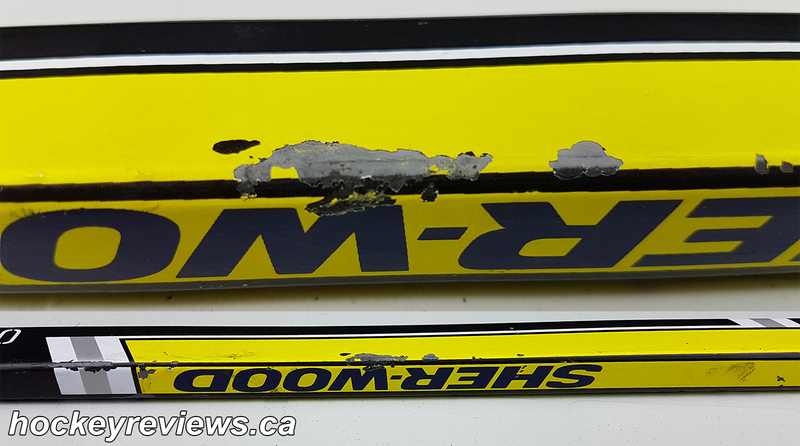 Showing paint damage, but no structure damage and the stick is holding up fine. I hope to get my hands on a Sher-wood T120 and T90 stick in the near future so I can compare those highly rated budget conscience sticks to others and try to find the perfect balance of cost and performance.